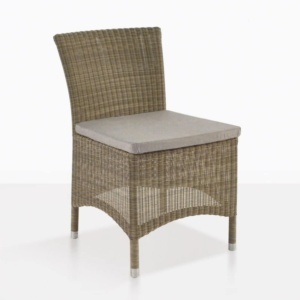 The Enna Wicker Dining Chair elicits visions of nostalgia and a carefree ease. Imagine gathering around one of our a-grade teak dining tables with your family and friends for a communal meal that should only be accompanied by exceptional comfort. The Enna Wicker Dining Chair embodies both delicacy and immensity to create an unforgettable outdoor dining experience making it the perfect addition to traditional and modern spaces alike. 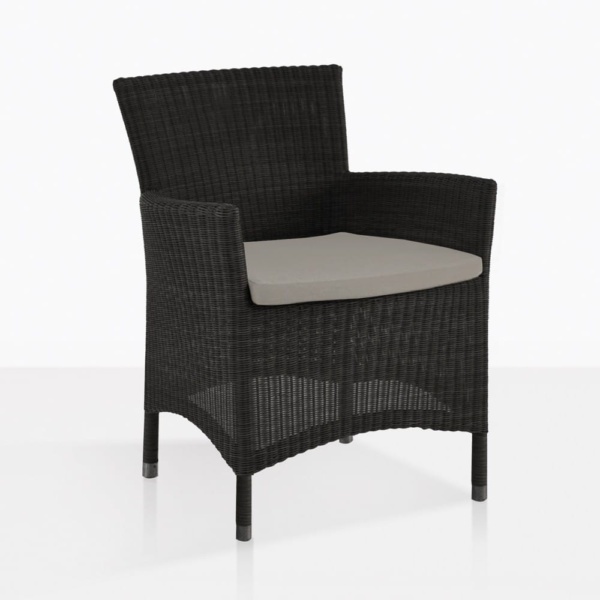 The wicker used at Design Warehouse is made from high-end fibers that create a hard outer shell creating pieces that are weather resistant and durable. Our wicker also has the ability to stay cooler, even in the sun, than other materials. The Enna Chair will come with a Sunbrella® cushion as shown, for added support and comfort to your outdoor dining experience. Call us today and speak to one of our team members about any of our wicker products to create your own beautiful outdoor space!